We started part time in a small room built onto a barn in my Dad's backyard in 1987. We opened nights for 3 hours and the business kept growing and in less than 3 years (1990) we moved to our present location. In 1996 we opened another retail location but that proved too much for me to handle in that it cut down on my Hunt'n & Fish'n time. Having money is good but there has to be a balance in life so we scaled back in 1998, closing the 2nd retail location and concentrated our efforts on our one retail location and internet sales. We have been selling on Gun Broker since 1999 and we are very close to 2000 positive feedbacks on the Gun Broker Site. 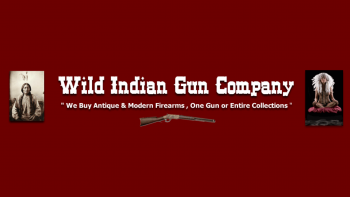 We enjoy selling online and we take pride in providing great service and products to our many customers, as you know we have the Wild Indian Gun Company website for online sales. We just completed an overhaul of the site by changing the look, format, and installing a new shopping cart that we know will better serve our customers . We hope to expand our presence online and we hope you have a good experience shopping with us online. We hope that you will share your online shopping experience with us, with your family and friends.